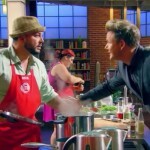 Screencapture from the May 20, 2015 episode of MasterChef, “The Battle Continues”. Download available via Amazon Instant Video. We’re back for the continuation of the season premiere, where the top forty home cooks in America (picked by FOX, at least) had to battle it out for their place in the top twenty. Each had to face off against another hopefully in a battle of signature dishes, based on their common theme or ingredient. Eleven home chefs have earned their place in the MasterChef kitchen, but the rest have to continue the battle now for the remaining nine spots. Hetal is first up this round. She’s a start-up developer from New Jersey. Her parents came to New Jersey from India, and she says that’s where her love for food came from—even now her mother sends her boxes of Indian spices for her kitchen. She’s into baking because of her background in biochemistry. She’s competing against Jill from California, a stay at home mom to four boys and with shocking pink hair. (Isn’t the retro/punk 50s look over and done with yet? Her look is rather painful on my television screen, so I’m already hoping she won’t make it past tonight’s episode.) It’s going to be a battle of fruit desserts. Hetal is making a puff pastry with apples—an apple pie with an Indian twist, she says. Jill is making a Danish Aebleskiver (no, I’ve never head of it before either) with raspberry creme. Two very different dishes, Christina says. Jill has the more technically difficult dish, she has to know what she’s doing with that cast iron pan that she’s cooking the pastry in. Gordon is surprised it’s being cooked entirely on the stove top and not in the oven. Hatel is first for the tasting, with her caramel apple puff pastry cup and cardamom whipped cream. There’s a good tap on the puff pastry, and Christina loves the use of spice. Gordon disagrees with Christina and thinks it’s a safe dish, not as spicy and interesting as he thought it should be. Graham likes the spice element to the dish and the perfume. It’s a really good dish, he says. Next we get another quick montage of seven more chefs getting their white aprons, leaving just one place left in the kitchen. I’m sure we’re in for another sob story moment here, as the sad background music starts playing! Yep. 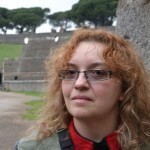 This battle is going to be feature Shelly, a single mom who works as a kitchen assistant from Brooklyn. She does “third world fusion” cooking, she says, trying to elevate cheap ingredients into something special that her daughter will enjoy. She’s competing against Christopher, a restaurant manager from Los Angeles. He “sells happiness”, he says, and he seems quite confident. Also rather dorky. It’s going to be “battle chicken” for Shelly and Christopher. What can the both come up with in thirty minutes? Shelly comes from a Jamaican family so she’s doing escovitch, a dish that reflects her roots. Christopher is doing his take on “sweet and sour” chicken but with some unusual flavor combinations: arugula and strawberry, definitely not your traditional Chinese recipe. Graham seems to be favoring how Shelly’s dish is coming together but Christina is intrigued by Christopher’s dish. Hands up and now it’s time for tasting. Shelly has her escovitch chicken with sweet plantain mofongo. The plantain is lightly fried and then mashed with minced garlic, she explains. The chicken could have been juicier, Gordon says, as she cut it too soon out of the oven and lost some of the juices. That, and the huge mound of plantain is a little too much on the plate, dwarfing the chicken. The chicken has a good spice and heat but the skin needs more crispiness. Christina says it’s just a little underwhelming for her. Christopher is next, with his chicken scallopini, strawberry agrodolce and rosemary parsnips. Graham says the chicken should be the hero of the plate and it’s not, but the parsnips are delicious. The sauce is unique. Not bad. Gordon says the chicken is delicious, but the rocket salad shouldn’t have just been dumped on top, that’s not MasterChef style. Christina says the flavors are curious to put together…but did he push the flavors too far? She’s not sure. It’s a tough decision for the judges. Christina says for her there is something behind the inspiration of Christopher’s dish that edges her vote to him. Gordon is going for Shelly because he thinks he can develop her better. Graham is indecisive and goes to the two contestants to plead their cases. Shelly says being a first generation American is hard. She has a bachelor’s degree but is working for only $10 an hour. But just like Shelly, Christopher is there for the American dream too. The twenty home cooks who have won their aprons enter the balcony of the MasterChef kitchen, wearing their white aprons. To win those aprons they had to beat out the other twenty who now enter the floor of the kitchen for what seems to be final words of goodbye and encouragement from the judges. But, it turns out some of these twenty are going to get another shot at winning an apron, Gordon announces. Only six of them will be competing for two remaining aprons. Each of the judges will pick two competitors to get another shot, based on what they’ve tasted so far. Graham picks first, choosing someone with a real burning fire…Taylor. His second pick was one of the most passionate cooks they saw: Stephen. Christina picks next and first chooses one person who really impressed her: Andrew. Her final choice goes to someone we barely saw before, Demetria, so we know nothing much about her at this point. That leaves two more for Gordon to choose for this final competition to win an apron: Jill is his first pick, and the final choice, which should be no surprise after the last battle, ends up being Shelly. 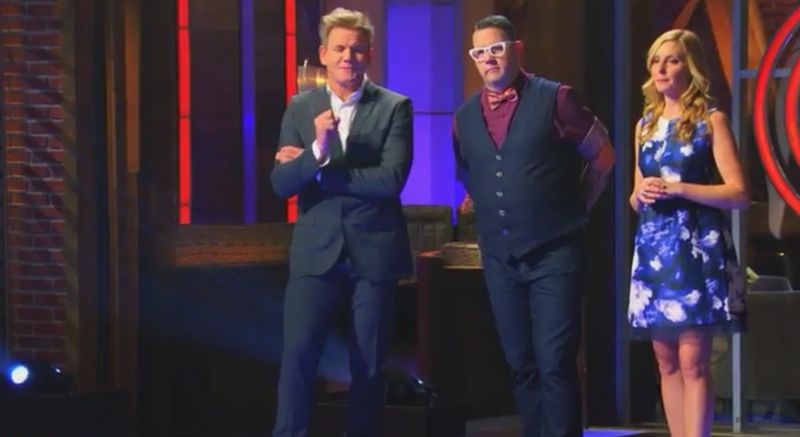 This is the last opportunity for two of these six to get in the MasterChef kitchen and the challenge is about nine basics, Christina tells them. Kitchen staples she always likes to have on hand at home including chicken, tomatoes on the vine, bacon, kale, heirloom carrots, mushrooms, blueberries, cheese and chocolate. Each chef gets a bag with these ingredients and a pantry basics box. 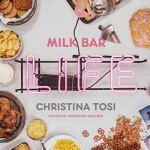 They all will have an hour to make a dish using however many of Christina’s favorite ingredients as they want. Christina wants to see something that really showcases these staples. Taylor is doing smoked chicken with a bouquet of herbs. Demetria is doing chicken roulade stuffed with bacon and a chocolate mole sauce…and cheddar cheese. Gordon wants to know if she’s mad with that flavor combination. It sounds all over the place, and she should work it out, he tells her. Andrew is doing a stuffed chicken thigh to represent Southern food. Jill is making blueberry barbecued chicken which Graham thinks sounds unusual but it looks like it could work. Shelly is doing mushroom cheese puffs with some gravy. Stephen is doing grilled chicken with fresh pasta. No more raw vegetables, Gordon makes him pinky swear. He’s multitasking like crazy and Gordon is impressed. Graham is watching Taylor and and Jill. Meanwhile they are really worried about Demetria’s strange combination of flavors and that there is no chance to rehearse to see if it really works—it’s all down to how these plates look and taste. The hour is up and time is called. First up for tasting is Andrew’s plate: he’s served them chicken thigh stuffed with mushroom duxelle, served with a puree medley of creamed kale and carrots, and a tomato salad dressed in bacon vinaigrette. The chicken is delicious, Christina says, but there’s one too many things going on here and she thinks he’s losing his focus. Gordon thinks there’s three purees on the plate, since Andrew pureed the duxelle, the kale and the carrots. Andrew wants to argue with Gordon about the duxelle, but it’s not a good idea to disagree with Gordon like that! Gordon makes Andrew put on his jacket and stand up on the judging platform to listen to what Graham has to say: yes, there are three purees on the plate. After clowning around, Gordon gets serious. The combination and execution of the dish is wrong, even though the chicken was cooked very well. Taylor is next for tasting. He has a pan seared chicken with wilted kale and carrot mashed potatoes. He deglazed the pan to finish the dish. The herbs he used come right out in the flavor. But the puree is gummy, Graham says, which is disappointing since Taylor was one of Graham’s picks to come back. Jill is next with her blueberry bbq chicken, served with scalloped carrot and potato and a kale salad with apple cider vinaigrette. Christina says it looks like a proper bbq chicken, not smurf blue as she feared it might be. There’s a lot of flavor in the chicken and the gratin is delicious, but there’s a lot of heaviness to it in the cream used that drowns out the quality of the heirloom carrots. Next is Stephen. He has grilled chicken with pappardelle pasta and mushrooms, along with roasted vegetables. It’s a huge dish, too much on the plate and it may not be cohesive. The chicken is cooked nicely. Forget the cream sauce, Gordon says, the salsa verde he made for it was enough. There’s something about Stephen’s energy, though, that Gordon likes, even if his plate was over the top. Shelly is next with her mushroom fritter, with kale salad, fried chicken skin and roasted tomato with balsamic sauce. Christina says it’s really delicious and loves her editing process but isn’t sure how to eat the chicken skin. It doesn’t seem plated or used right on the dish. Demetria is last with her chicken roulade stuffed with kale and bacon, served with sauteed potatoes and mole sauce. Graham asks her to explain the mole sauce, which is just smeared on the plate beneath the chicken. Why did the chicken cross the road? Graham asks her. “To get me an apron,” she says. No, Graham says, it’s to escape that “s–t-stain” on her plate! Ouch! A smear of dark brown like that definitely isn’t the most appetizing to look at, but even so I was pretty surprised to hear Graham say that! It looks like the chicken’s plated on a diaper, he says, making the insult even worse. He seems very disgusted and Demetria looks mortified. Christina is gentler in her review and says the bacon is a nice touch, but the mole…she doesn’t understand what Demetria was going for there. So now it’s time for these six to learn their fate. The judges need a minute to discuss and make their decision. They ask Demetria to step forward first. Her second gamble didn’t pay off, she’s going home, no surprise there. The next two called forward are Taylor and Shelly. Graham has one apron to give out between them and he’s going to give it to Shelly. 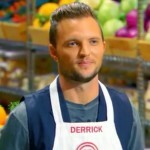 That leaves Andrew, Stephen and Jill as the last three vying for a spot and only one will receive an apron. There’s something exciting about Jill’s flavor profile, Andrew has proper technique and he puts love into everything. Stephen is like a whirlwind and it’s tough to slow him down. Stephen could go a long way in the competition so he’s getting that last apron, according to Gordon. That means Andrew and Jill are also going home. And so we have our top 22 competitors at last – you can see the whole line up at FOX’s MasterChef home page. Overall, I’m surprisingly excited about this year’s batch of hopeful MasterChefs. There seems to be a lot more ethnic diversity in the group this year than before, which hopefully will lead to us seeing a variety of dishes being prepared and different culinary viewpoints expressed. Of course we still haven’t really “met” some of the contestants who weren’t given much camera time in the opening episodes, but overall most of them seem rather nice and positive people, who even in these one-on-one battles weren’t shown as being snarky or heavily competitive against each other except in showing respect. Could the producers have actually listened to some of the casting complaints about previous seasons? Especially last year, when it seemed almost telegraphed from the start that Courtney was being set up as the winner? I guess we’ll have to wait and see. It’s still too early for me to tell how Christina is going to do as a judge on the show. I want to see more of her personality before deciding, although she seemed fairly critical and praising toward most contestants. I was actually still quite shocked by Graham’s rude comments toward Demetria and her plate—are they going to have to turn him into more of a “mean judge” now that Joe is gone, and Christina obviously isn’t meant to take his place in that way? I hope not because I always enjoyed Graham’s commentary in the past and his attitude toward food. im so pissed. masterchef us has dropped soooo much in quality and its so overproduced and plastic. the new judge is condacending, rude and not very professional in her judging. they could learn ALOT from the Australian masterchef. but who am i kidding, its fox.. im a huge masterchef fan so this is killing me. the previous seasons is so much better. and it feels like everyone is scripted and are acting.